The Entrepreneur’s Journey: a map to help you navigate the trials and tribulations of creation. After hustling every minute of every day…. You see the top. It’s within reach. When you began, the wins were easy: beginners luck is on the side of every person starting a new adventure. But once outside the ramparts of Median City, the easy wins vanish. Trials and challenges take their place, testing your intellect, passion and resolve. The shock to your system reverberates down to your soul. Your heart sinks. You see the logic and reason in their choice to turn back…but the thought doesn’t comfort you; it boils you to the core. Your feet stay frozen, planted to the ground, not wanting to concede an inch to that coward know as fear. Yet here you are, all alone, refusing to go back. In the midsts of uncertainty, you take a step forward. The fear subsides and you feel…free. A weight has been lifted. It’s as if you were carrying their packs, and them, all along. No longer. You set off on your own, your burden less heavy, your mind more clear with every step. With full conviction and complete commitment, you keep marching. At the top, you look around; all the progress you’ve made? A drop in the bucket compared to what lays ahead. Every day you learn something new. Each day, you become better: your skills expand, your strength (emotional and physical) improves, and your instincts become more refined. You handle your sword and shield effortlessly, as if the heavy steal is made of feathers – as if these tools are a part of you now. When the path diverges in the woods or stops dead in its tracks, you don’t wait for someone else to tell you where to go or what to do – instead, your heart tells you left or right and you go – no hesitation. But there’s a side-effect to improvement: every increase in strength, intellect, and resolve brings with it a new path, a new obstacle, a new challenge that would have forced you to turn back just weeks or even days ago, but now its within your ability to overcome, conquer, or complete. Your skills have improved. So have the challenges. And with each new lesson-learned comes a painful realization: how much you still don’t know. It’s as if for every step up the jagged, rocky slope of Tribulation Mountain, another mile of perilous journey appears before your eyes. Each day you think you’re there but it’s another false summit. More than a few times you want to quit; to throw in the towel and head back. Yet with each renewal of commitment to stick it out no matter what, providence provides you what you need; a new friend who walks the path with you for a while, access to new tools and resources to help you along the way, an easy win you didn’t expect (even the smallest win in times of desolation can change everything). Through the wastelands, deserts, and valleys, you keep marching. After so many tests, so many obstacles, so many struggles, you’re within reach. You rise and make your way to the top. But then you spot something on the horizon, opposite the way you came. A distant light that glimmers in the fading sunlight. The whisper of light vanishes as quickly as it came into view, but the vision…the vision sticks with you. You don’t know what it was, but your heart does. You make your way down the mountain. Do you turn back or keep moving forward? You answered that question a long time ago. Want your own metal print? Post a comment below and I’ll hook you up. Hi Tom, I absolutely loved this piece. A couple of times I thought of a couple of things to add, eg the more you learn, the more you realise you don’t know. But I read on and you covered that too. I’d like to make a constructively critical comment, but there’s nothing more to say. You said it ALL. Good work. I look forward to more stories as the journey continues. Great read….even better drawing. You’re turning into my personal hero! Brilliant! Loved the story, and the drawing even more. Entrepreneurial journey disguised as fiction. Awesome idea indeed. This is awesome! Don’t give up your drawing gig just yet. It’s the best representation of the entrepreneur process I’ve seen so far. Can I get a bigger copy of the Dip Drawing somehow please Tom ? Even on the Enlarge I can’t read any of the words on it. I want to show it to my buddy who runs something called Territory Mapping as a way to show the vital importance of Territory to is humans. The different Territory Maps front line staff create compared to Comfy little drawings by Director types opens a radically different approach to developing the biz etc . Territory Mapping and our VizBiz system look like a great fit with your work. As per my earlier note … long list .The Qollaberative is ready ! Thanks for the great story and drawings. They comfort my struggling soul. The struggle is who I am and it is joy. I could not live any other way. I am “the resistance”. Thanks again. What a great message and accompanying diagram. Life is just a hike through challenges both known and unforeseen. Failure isn’t a sign of defeat but rather a lesson for the next success. I’m so glad you posted this as so often do we get down on ourselves for not having the outcomes you had hoped. Instead, we need to keep matching ahead to tomorrow where the next adventure awaits. Thanks for the beautiful post! Thanks so much Lisa! You hit the nail on the head. Thanks for leaving a comment and sharing with the rest of us! Since I’ve become an entrepreneur, I’ve come up with many exciting ideas for my business — but every single time, I’m overwhelmed by how much more there is involved in executing it then I ever realized!!! I just need to accept that’s it’s always going to be that way — there were always be more things that I need to learn. Thanks so much Nicole! It is absolutely worth it. Same to you! Life, is full of ups and downs. The 9-5 grind can feel more like a merry-go-round going around the same things day in and day out. The great thing about being an entrepreneur is it’s more like a rollercoaster – like life, there are challenges to breakthrough and learn from, plus incredible highs to celebrate. It’s challenging, but I believe it’s worth it – and it sure beats monotony. Best wishes for rising to your next entrepreneurial peak. This is fantastic, Tom. 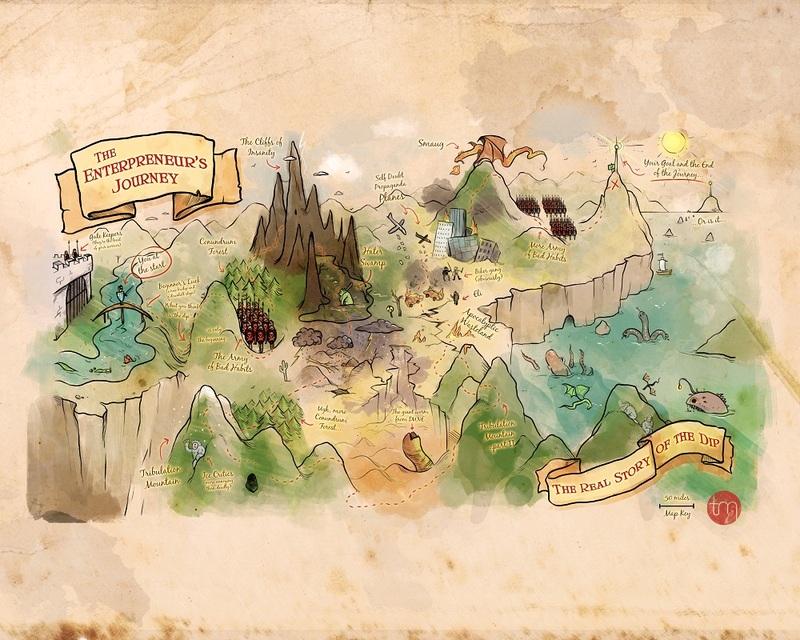 I loved the visual of “The REAL Entrepreneurs Journey.” I don’t think I’ve ever seen a diagram that captures this so well. I found myself nodding in agreement with each phase of the journey. Well done. Here’s to continuing the march forward. hahaha, thanks so much Michael! So glad you liked it. 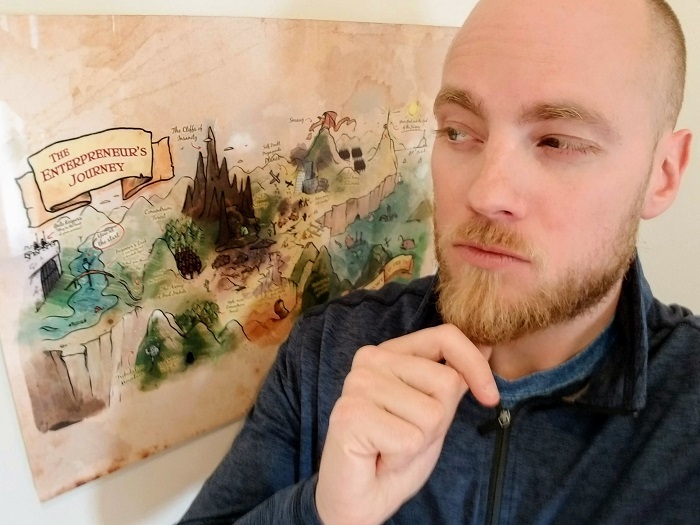 I stumbled upon this article through someone else’s site (can’t remember who) and loved it so much that I included it in my monthly Link RoundUp! I especially loved the drawing you made. Funny, real and motivating at the same time!